I’ve been craving chips lately. Just good old plain salty chips. Maybe it’s a sign that I need more salt in my diet – or maybe its just a sign I love chips! Either way, I decided that it would be the next food that I would learn how to make. There are a lot of good recipes out there for home made chips with exotic flavours of herbs and spices but, honestly, what is wrong with the good old salty chips that I grew up eating? I love salty chips that you eat at the beach, that you have with fish and chips, that you get at restaurants. Just the normal, good old chips – or ‘french fries’ as everywhere outside of Australia seems to call them. The recipe below turned out to be a big success – they were exactly what I wanted. I don’t even feel AS guilty eating them because they aren’t fried in grease and oil. They are just baked in the oven with oil and salt. Step 1:Preheat oven to 180°C . Lay out a baking sheet on a baking tray (you may need two baking trays depending on the size of your potatoes). Step 2: Rinse the potatoes very well under water – you want to get rid of as much of the dirt off of them as you can. Step 3: Cut off any deformities/growths that your potatoes might have. From here cut the top and bottom off your potatoes (this will give your chips the perfect french fry look). 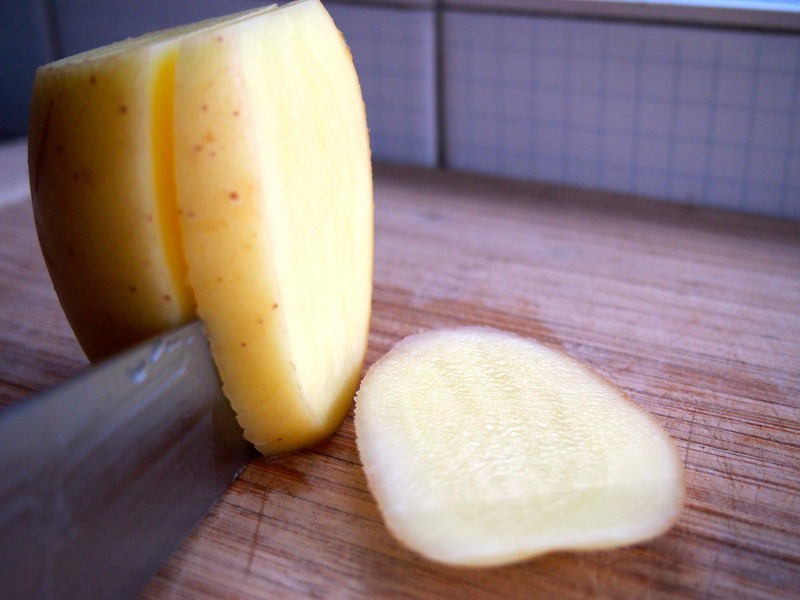 Step 4: Stand the potato on one end and slice the potato down lengthways in the thickness that you want your chips/fries cut (about 2 cm thick). 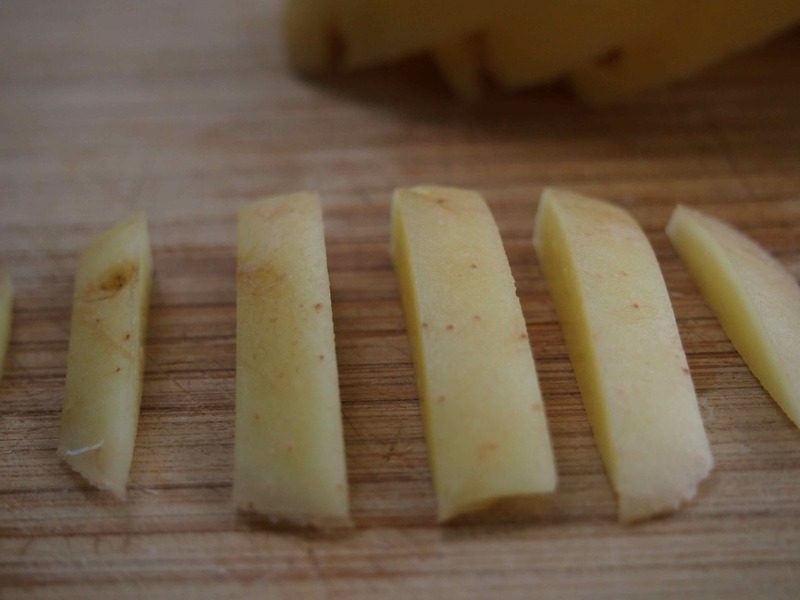 Step 5: From here, cut those slices into french fry sticks using the same measurement of 2cm thick. *Note try to keep the same thickness that you cut in Step 4 as you do in this Step so that your french fries look prettier. Repeat Step 4 and Step 5 with remaining potato/s. 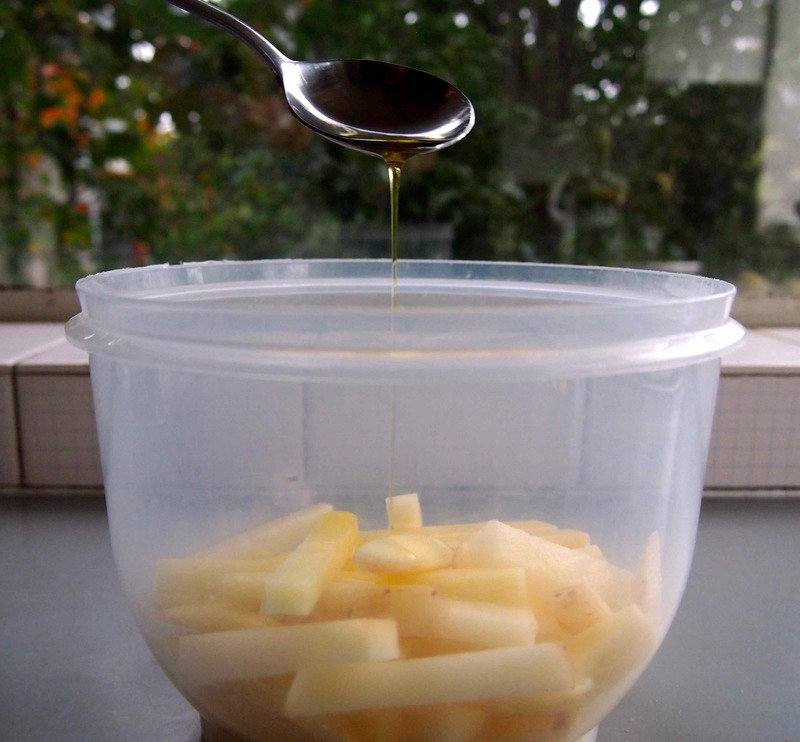 Step 6: Once you have cut all the chips, place the sticks into a bowl and add the olive oil and 1 teaspoon salt and toss until the chips are completely covered. Step 7: Lay out the chips evenly on the baking paper – make sure that the chips do not cover each other and are lying flat. Sprinkle another teaspoon of salt over the fries. Note* do not overcrowd the baking tray as this will result in the chips baking unevenly and affect the end result of good chips. Step 8: Bake for 20 minutes. 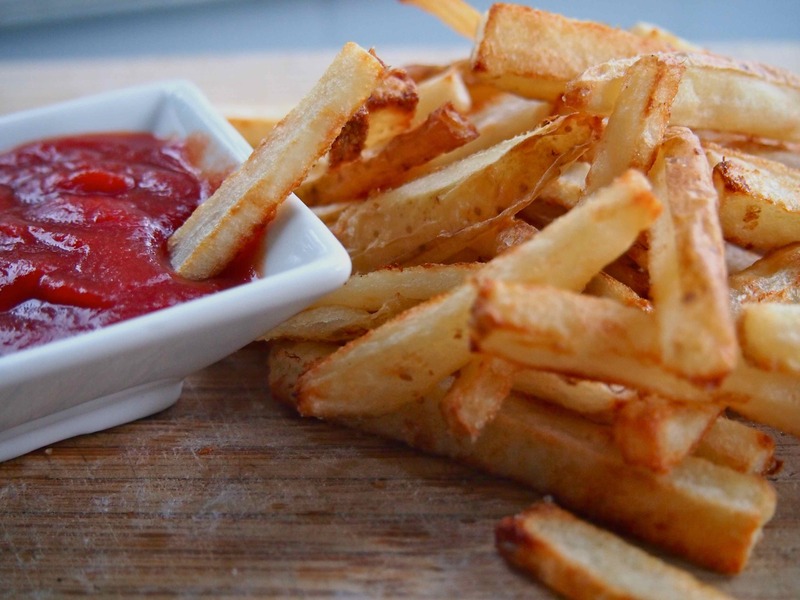 Step 9: Flip the fries over and bake for another 8 – 15 minutes or until the chips are crispy. It is a total of 28 – 35 minutes of total baking (or longer if you cut your chips thicker). Step 10: Take the french fries out of the oven, place in a bowl and serve. You may want to sprinkle extra salt onto the chips at this stage but that is personal preference. 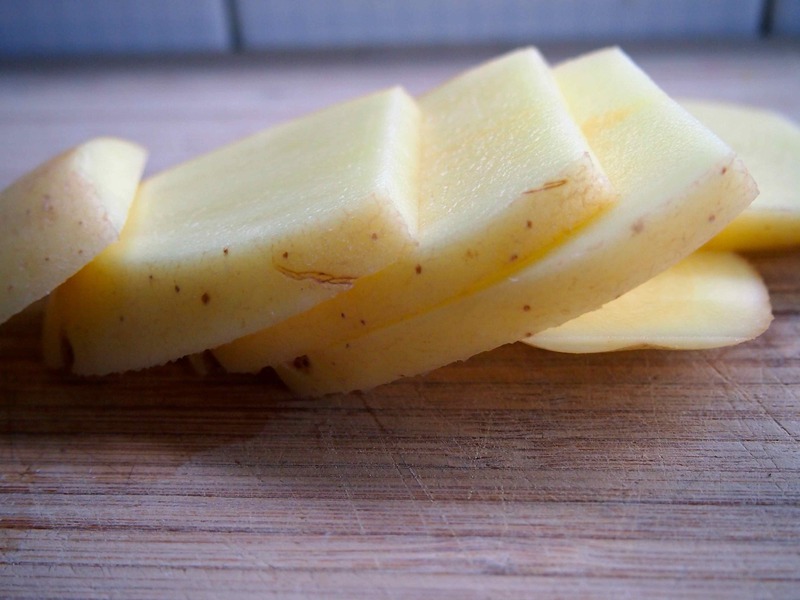 Steps 3+4: Cut the top and bottom off the potato and slice the potato down lengthways. Step 4: Cut potato lengthways. Step 5: Cut those potato slices into french fry sticks. Step 6: Add oil and salt to chips. I know everyone eats their chips differently, but I am a chips and tomato sauce girl – and you won’t find a better combo than that to increase your salt intake. So enjoy this somewhat healthy version of chips/fries. You’ve put the ‘hard’ work in and ‘burnt’ off a few meagre calories getting them ready or however you want to justify them! Or, in my opinion, who cares, they are chips, they are to ENJOY, so enjoy every second of them :). Theoretically this is just enough for two people, ‘theoretically’. Personally I reckon it depends on how big the chips are and how much you want chips. I love chips. I know! Few things better than hot chips! Thanks for sharing! I agree with you, chips goes very well with tomato sauce :). Usually, I also added ground pepper to the potato chips before frying them. I’ve never tried chips with pepper before, i’ll have to give that a try! Thanks Ami :)! Love “French fries”, I’ve got to try the oven baking as you suggest. Have you ever tried sweet potatos fries? They are my favourites! I haven’t tried sweet potato fries but I have heard that they are nice. I can’t have them unfortunately, but that’s ok because I’m going to assume they can’t be better than these 🙂 ! I was going to mention sweet potato fries. We make them, mix them with the normal potatoes to give your fries an extra flavour sensation. We love them as well. If you’re going to fry them then you wait to add them to the mix half way through the cooking of the normal pots. They take much quicker to fry or bake. We make all our roast potatoes this way to. A mix sensation for sure. Try it. It’s an extra healthy kick to your chips. Thanks for the advice here. I may change my deep frying habits of making chips into a baking way instead… for healthier options… will see, not too convinced with putting a huge oven on for a handful of chips. Loved your love for chips… and salt. Thanks for the great idea wendyb106. I’ll have to try adding a few sweet potato fries into the mix next time I make these “Hot Chips” :). The great thing about the healthier cooking option is, in my mind at least, you can have more without the guilt … although i’ll be honest I don’t really have guilt when I eat chips! They are! You’ll never look at the frozen ones the same! I fear that you will love them! They are so easy, simple and so so tasty! I will do that this weekend! Thanks for the recipe! You’re welcome! Let me know how you go :). You are a really terrible person! My mouth starts to water as soon as I see one of your postings, and I am starting to put on weight! And I do love chips! Haha pure evil I know! Thank you that is such an incredibly nice thing to say! The chips are amazing, and just think, they are much healthier than fast food chips so in a way you are ‘kind of’ doing a good thing for yourself :P.
Great recipe along with tantalising visuals! Thanks Hargun! Aren’t ‘french fries’ the best. There really aren’t many occasions where they just won’t satisfy you :). Nothing quite so perfect as oven fried fries. Definitely! Frozen oven ‘french fries’ don’t even slightly compare! Shudder. Shudder. They don’t even deserve to use the name! Haha agreed. It is much nicer freshly made in the oven! How beautifully delicious they look! Something you may want to try to perk up the plain old fried potatoes is to cut the potatoes into shoestring (very narrow, short) pieces. This way you get more crispy edges. I do fry them in Olive Oil, Coconut Oil or Avocado Oil. Here’s the SECRET and the NEW INGREDIENT I have started adding to them. In my Southern Utah area the herb Rosemary grows profusely. When I started doing this, I didn’t have any of the plants but our neighbor had them growing profusely and they hung down over our fence, it was a hilly area and they lived above us. When I made this I would just go out and peel some needles of Rosemary off one of her plant stems (peel the “leaves” back from the stem and they slide right off.) Then I would rinse them and cut them into as tiny of pieces as I could. When the potatoes (and onions) are about done, sprinkle the Rosemary pieces in and stir into them. Wow! I was pretty sick of plain old fried potatoes but this made them taste like a whole new thing! I LOVE Rosemary anyway. The smell is one of my favorites. I put Rosemary Essential Oil in a hot tub of water to soak in the bath. Its scent “wakes me, up”, as Rosemary is known for perking up the mind and bringing clarity. Sorry for this long response. Love your photo of the potatoes and will try this for breakfast today. Thanks for the suggestion Maggie Pea. I’ll have to give the Rosemary a try. I’m glad you like the photos and that you’ll give the recipe a try for breakfast :). They are so good. Only problem is that you finish them way to fast – well I find that to be a problem. Chips. Food of the Gods. Love the series of photos as you make them and the final product looks superb! Thank you! I find that when I find recipes to try it is easier if they have picture instructions so decided to do the same for anyone who decided to take the time to look at my blog recipes. You’ve done it well and it makes so much more engaging..
I’m yet to meet someone who doesn’t like them :). You’ll have to try this recipe! I’ll have to look up ‘salt and vinegar russians’ and maybe try them if they don’t seem too strange! I’m glad another country calls them ‘chips’ as well :).